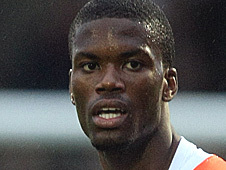 Winger Joel Grant is one of eight players to be released by Crewe. Calvin Zola, Danny Blanchett, Patrick Ada, Mat Mitchel-King, Ashley M Westwood, Bartek Fogler and Lewis Short are also leaving Gresty Road. League Two's top goalscorer Clayton Donaldson, winger Byron Moore and defenders Adam Dugdale and Harry Davis have all been offered new deals. The League Two club have also exercised the right to extend the contract of Antoni Sarcevic by another 12 months. Grant, 23, joined Crewe from Aldershot for £130,000 in June 2008 and played 106 times for the Alex, scoring 18 goals. Meanwhile, manager Dario Gradi has told BBC Radio Stoke he is unsure whether defender Gareth Owen will join from local rivals Port Vale. "I had agreed to bring Gareth in," said Gradi. "He approached us and we shook hands on a deal, which now looks as though it might not go through. "If that does, then that's my back four pretty well done. "I could perhaps squeeze a full-back in, but I might make room for another attacker and go with the defenders I've got." Crewe finished 10th in League Two, three points away from a play-off place.